Rocket Matter Knowledge Base Matter TemplatesHow to create a matter template for a brand-new matter. 1. 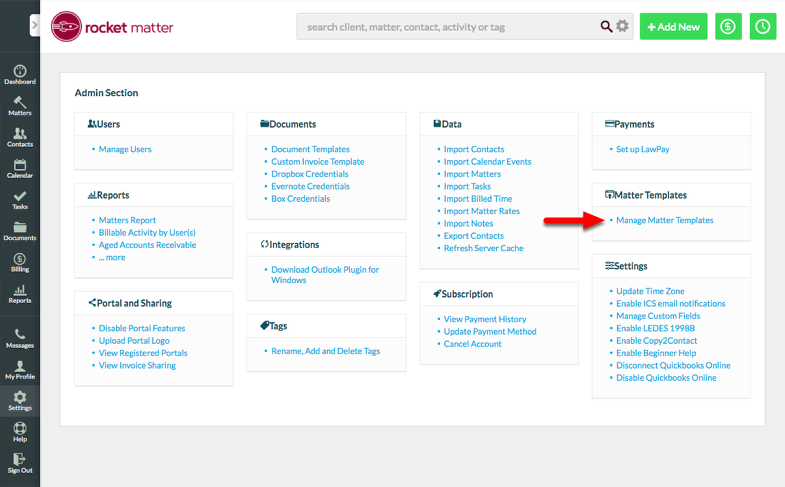 Navigate to your Admin Section, and click "Manage Matter Templates". 3. 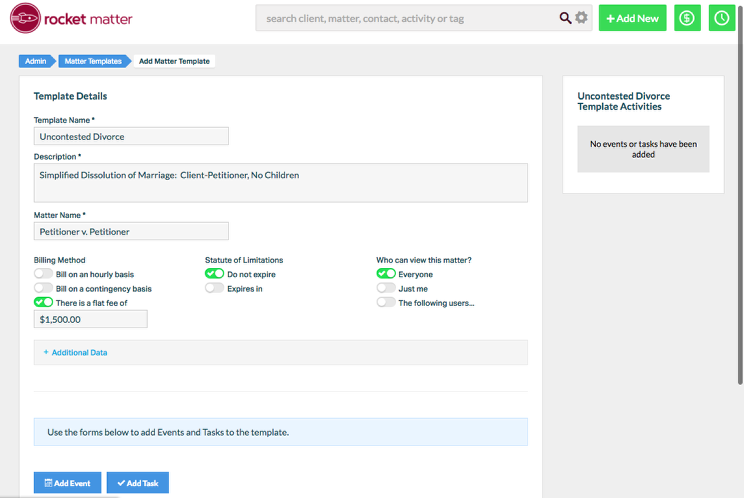 Fill in template details, including 'Template Name', 'Description', and 'Matter Name'. 4. Specify 'Billing Method', 'Statute of Limitations' and access privileges (if applicable). 5. 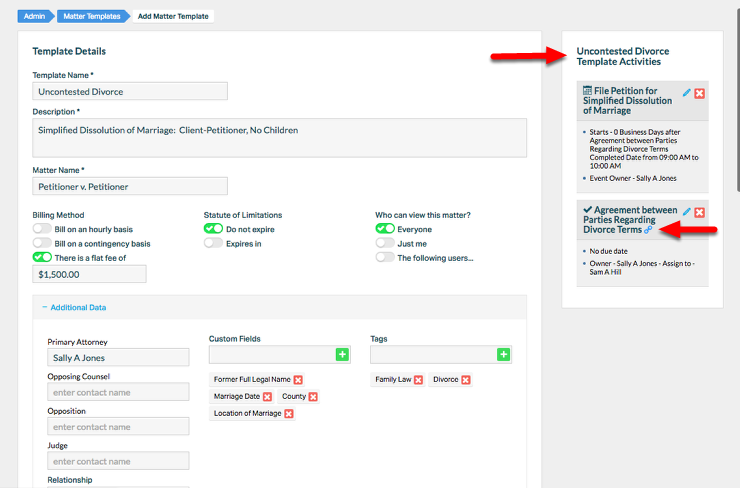 Select "+ Additional Data" to populate related contacts. - Allow the contact name to auto-populate if the contact exists in your Rocket Matter contacts. If the contact does not yet exist in your Rocket Matter system, you will be prompted to add relevant contact information. 6. 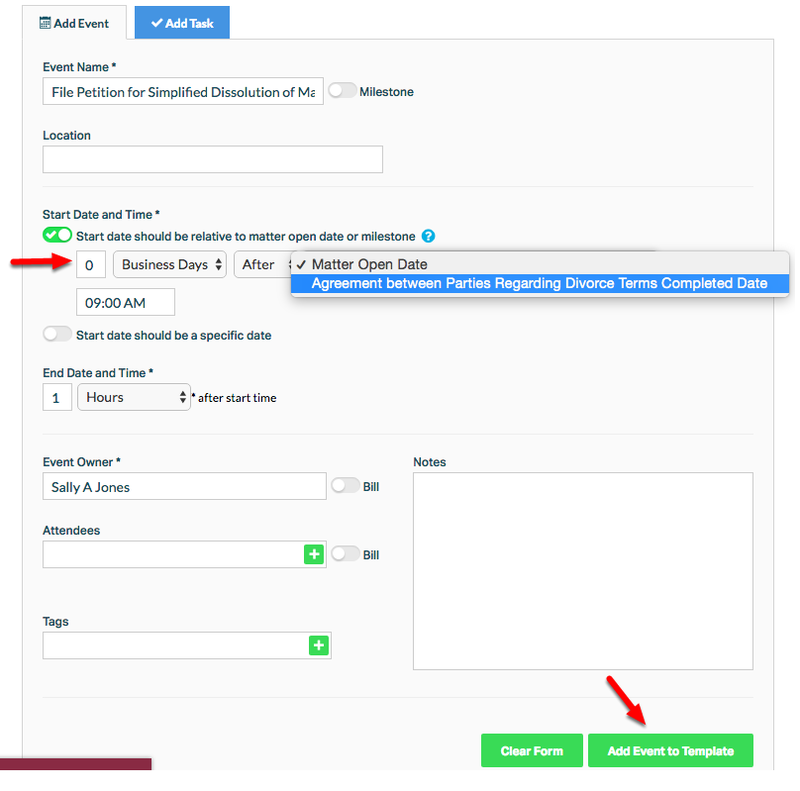 Click "+ Add another" or "+" to add custom fields or tags. Zoom: 6. Click &quot;+ Add another&quot; or &quot;+&quot; to add Custom Fields or Tags. 7. 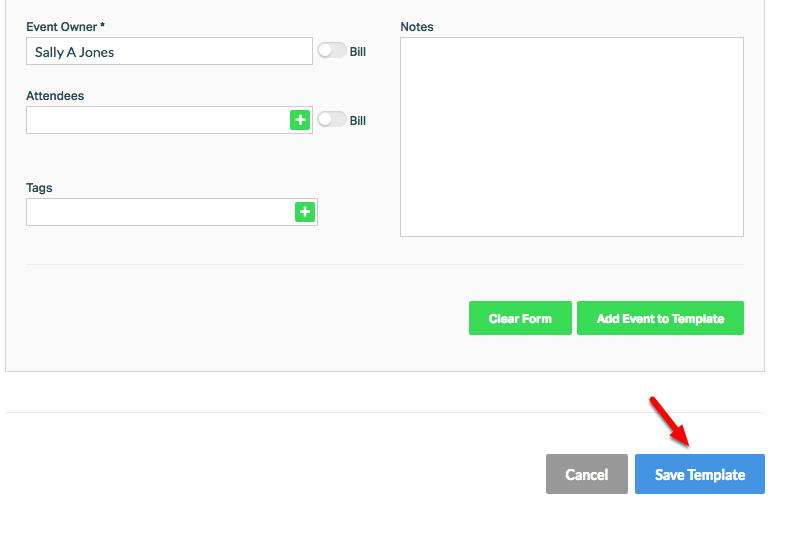 Click "Add Event" or "Add Task" to add an event or task. Zoom: 7. 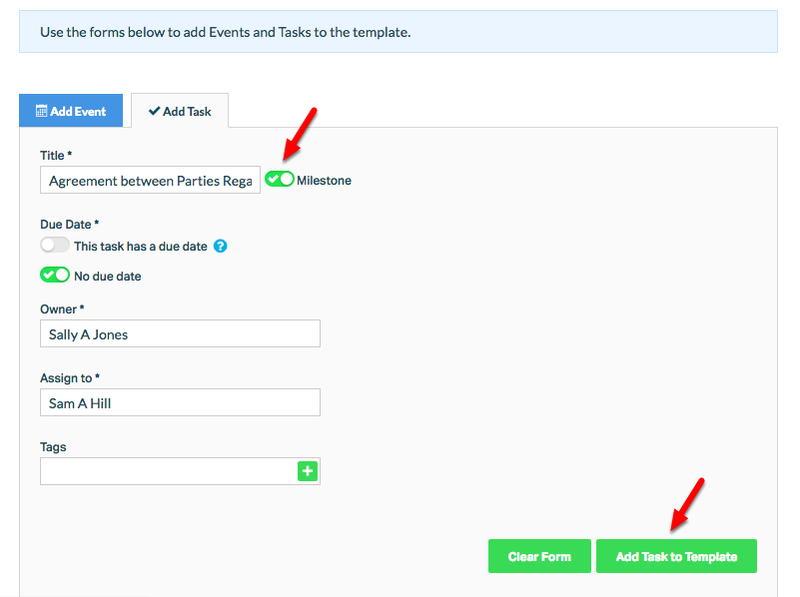 Click &quot;Add Event&quot; or &quot;Add Task&quot; to add an event or task. 8. 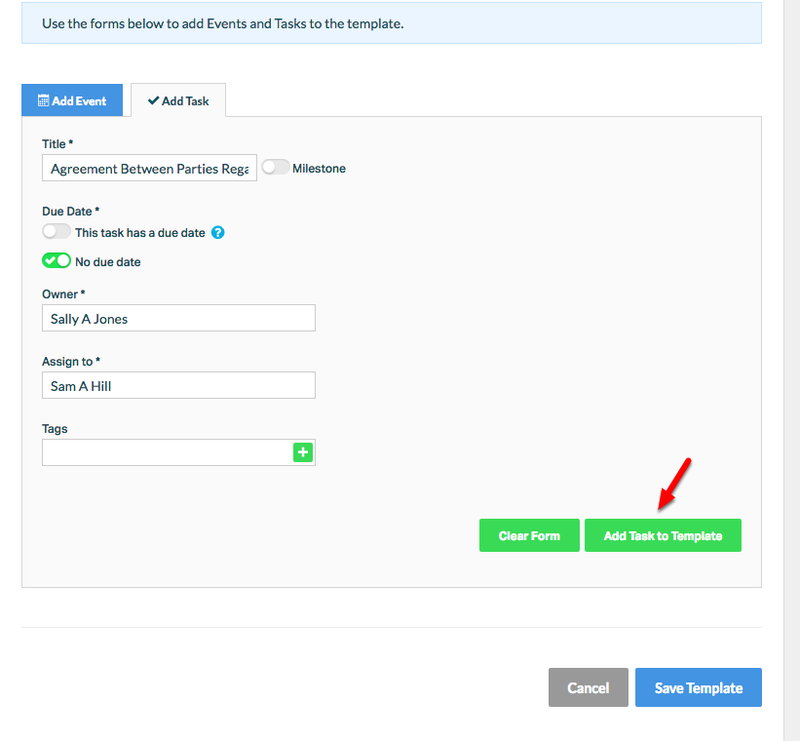 To "Add Task", fill in task details, and click "Add Task to Template" to the template task. - Multiple tasks can be added to a template by repeating these steps. 9. Mark the task or event as a "Milestone" to allow the linking of other tasks and events to the activity. - A Miilestone indicates that when that activity (Task or Event) is completed, another task or event is triggered. - Milestone activities are considered 'parent' activities. Subsequent related activities are 'children'. 10. 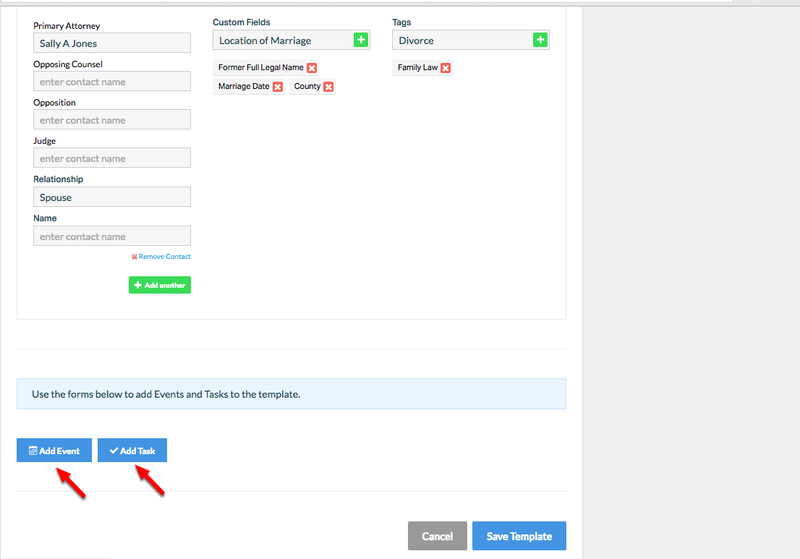 To "Add Event", fill in event details, and click "Add Event to Template" to create the template event. 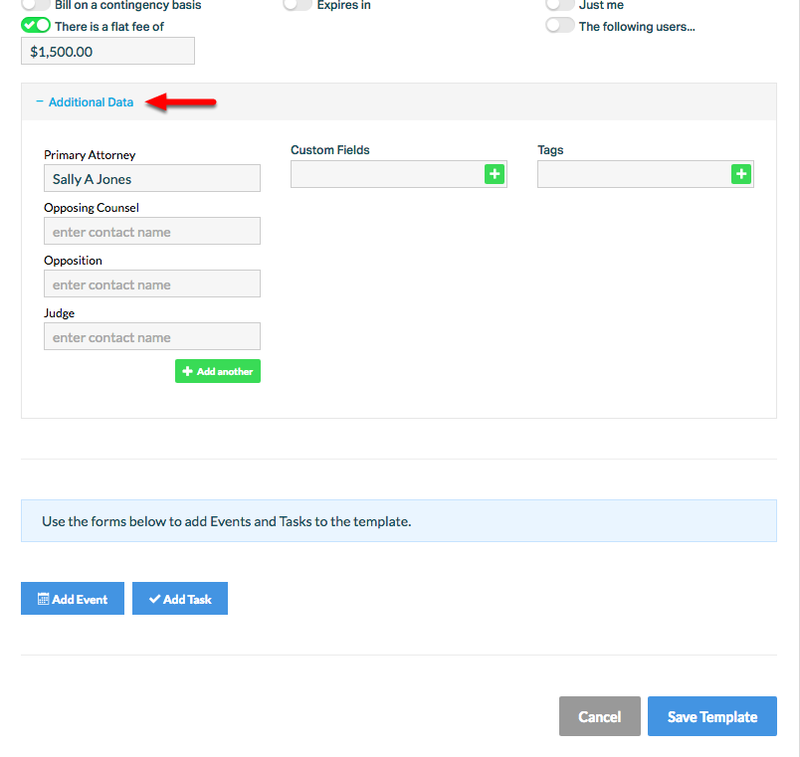 - Bill for your timekeepers by selecting "Bill" next to the timekeeper name. 11. 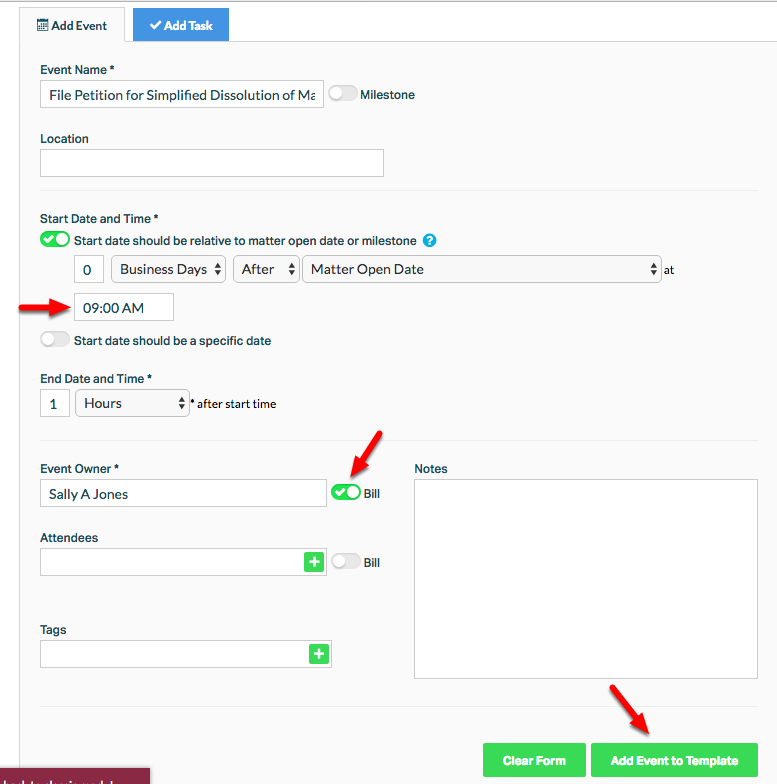 Link an activity by specifying "Start date should be relative to matter open date or milestone". - Utilize options from the drop-down menus. 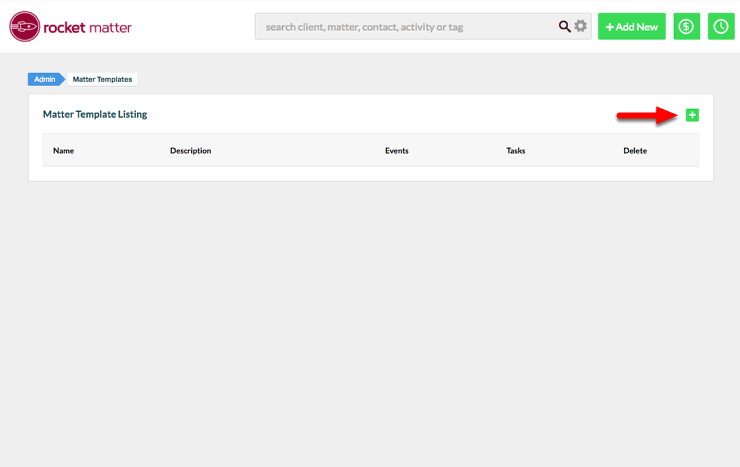 - If you are unable to link the activity to a previous event or task, check to see that the parent activity has been marked as a Milestone. 12. Review your list of matter template task and activities. - The blue "link' icon indicates that the activity is a Milestone, indicating that once completed, other activities are triggered. How do I edit an event or task on my Matter Template? 13. Click "Save Template" after making any changes or additions to your Template. Prev: How to apply a matter template to an existing matter. 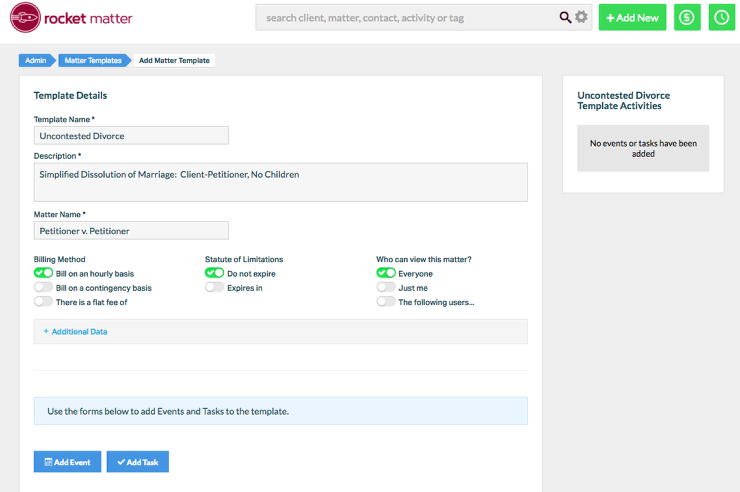 Next: How to create a matter template for an existing matter.